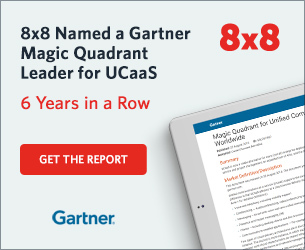 Improve CX Metrics with Cloud Communications | 8x8, Inc.
Do customers hear this when they reach your contact center? If not, it’s through no lack of effort on your side. You’ve trained your agents and given them the tools they need to answer customers’ questions and resolve issues. Every time agents get a new contact, their desktop displays customer-relevant information. Agents know how to access the knowledge base. They’re well versed in company products, processes, and procedures. The challenge is this: nowadays every inquiry your agents get is tough. The easy stuff is done via self-service on your website or via your Interactive Voice Response (IVR). When someone wants to connect with an agent, it’s because they’re unable to find answers elsewhere. They’re exasperated and frustrated. So what can you do to prepare your agents for these types of interactions? Give them access to the experts. According to a major new study by Aberdeen Group, it’s time to unify the contact center with the rest of your enterprise. When your agents have exhausted other avenues, enable them to immediately reach out to the right subject-matter experts to get their answer. Your customers aren’t transferred or forced to endure long hold times. They’re happier—and your agents are too. 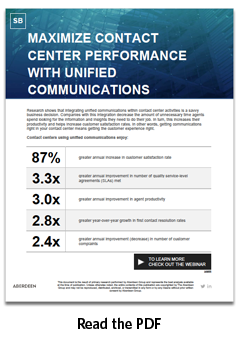 Aberdeen’s survey findings show year-over-year improvements in customer satisfaction more than doubled for companies that have integrated unified communications with their contact center. 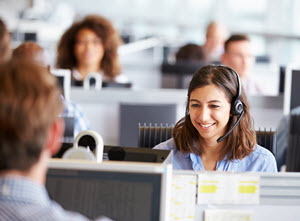 Customer retention is higher–the study shows a 9.9 percent improvement for companies integrating the contact center with the business, as opposed to 5.3 percent for other companies in the study. And, customer complaint metrics are markedly better as well. So, how to proceed? Assess the approach that will work best in your company. Reaching beyond the boundaries of the traditional contact center will require buy-in from other parts of the business. For enterprise-size businesses, you have an ally in your Chief Customer Officer or Customer Experience Officer. He or she doesn’t have to be sold on the business value of improving customer satisfaction—that’s the focus of their job. If you work for a small or mid-sized business struggling to show differentiation, walk across the office or down the hallway and talk with other leaders about how unifying the contact center and the business can help. Use metrics and statistics. Highlight the successes other companies have realized. You can learn more about real-life proof points, case studies, and success metrics, by joining the Aberdeen and 8x8 webinar, Dialing Up Your CX Metrics: How unified communications improves your contact center. It can transform your contact center—and your business—when you partner with others across your company by integrating unified communications with your contact center. Based on the Aberdeen research, you’re likely to see a difference. Kay Phelps is a contact center professional who has worked in the industry for more than 20 years. Her experience spans systems engineering, defining requirements for new products and new releases, as well as product management and product marketing. Kay is a frequent speaker at conferences and webinars, has authored numerous industry articles, and has blogged extensively on all things contact center. Kay holds a Masters in Computer Science from Colorado State University as well as a BA in Computer Science and Journalism from East Tennessee State University.